Cedar West is a family-owned, Australian company. All of our timber joinery is manufactured here in Australia by experienced craftsmen. Our modern manufacturing facility sets high standards for safety, quality and compliance. Australian AS2047 accreditation has not only been achieved, but exceeded on a wide range of our doors and windows. 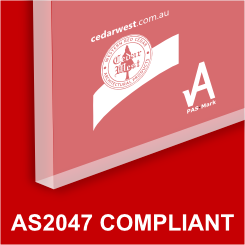 The AS2047 Standard is the mandatory minimum specification by the BCA for windows and doors used in Australia. When you choose Cedar West, you can be confident that your timber joinery will be built to last in accordance with strict Australian regulations for safety and workmanship.